Sustainability in architecture is not a trend, it is now a given -- like inside plumbing, New Yorker architecture critic Paul Goldberger said last night at the Tenement Museum in New York's Lower East Side. 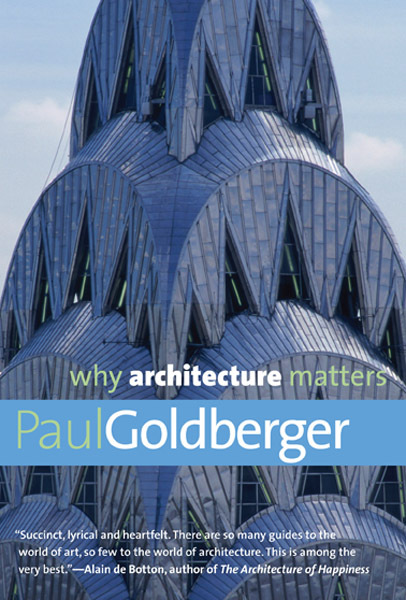 Goldberger also shared his top two favorite places in New York — which turned out to be not buildings at all, but Central Park and the Brooklyn Bridge — as well as his views on “starchitects,” the function of memorials in American culture, and the transforming power of architecture. The evening made me think. About the built environment of New York City, but also about the parallels between events and buildings, how meetings can be seen as structures for creating community. They can play a role — if a much more temporary one — similar to that of architecture in shaping our social environment and interactions with each other. Goldberger appeared at the museum as part of the “Tenement Talks” series, which occur every week, and sometimes more often. The events are far from fancy — participants sip inexpensive wine from plastic cups, and sit on folding chairs. The main thing, however, is talk — the series brings in an fascinating array of authors, academics, artists, and performers to speak about everything from historic waterfront strikes to Jewish cooking to Civil War history. I love the museum, but I became a member because of Tenement Talks — even though admission to them is almost always free. I want to support them, because they connect me to people who share my interests. Architecture represents the real, and is ever more precious in an age of virtual. Every piece of architecture is an opportunity for real experience. I could have stayed home and read Goldberger’s book, or hoped the museum would archive the talk. But I went and had an experience that I will remember. Thank you very much for your comment and contribution, Tahira. Goldberger also talked about how good architecture strikes a balance between aesthetics and functionality, which is also true of good meetings, I think. Good point about follow-up. How absolutely wonderful, Barbara. Tahira's post above reminds me of the buildings that go up every time there's a World's Fair–the 1893 World's Fair, in Chicago, was built almost entirely of papier-mache–but the impressions they leave are lasting. And I'd add one more thing to the meetings-as-structure analogy: keystones. critical in any relationship; absolutely, um, key in meetings and conferences, whether it be a purpose or a point person. Thanks again!